The Carnegie Library in Temple, Texas. 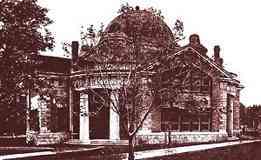 Temple built its library in 1902. Although this building burned in 1918 it is partially responsible for the well oiled machine that is the Temple Library today. A dispute over construction (the architect wanted a portion of the building brought in line with his blueprints) resulted in the contractor leaving town and the library half finished. The Carnegie Corporation furnished additional funds and the contractor's bonding company paid $2,500, which completed the building but left no money for books (a frequent problem). A citizen of Temple -- who shall remain nameless because someone forgot to record the name -- loaned the library $480.00 interest free and 1500 volumes were purchased. This figure is not a misprint: 1500 books for $480.00! After the library burned the land became a park and library funds, which were supposed to be held, were loaned to a local farmer. Upon his death in the 1940s his 44 acres had increased in value and became the property of the city, therefore a large increase in the library fund.